It’s summer, and it’s hot outside! Did you shiver reading about the battles and attacks in the Atlantic and Arctic Oceans and the land battles in Russia? Between 1940-1943, the British navy had to keep the supply routes across the Atlantic open for transports bringing weapons and food from the United States. British warships were mostly outdated and in the beginning their air force did not have range to protect the fleets. German U-boats waited along the routes, even dominate some trade routes and forcing cargo ships to take the longer routes for safety. 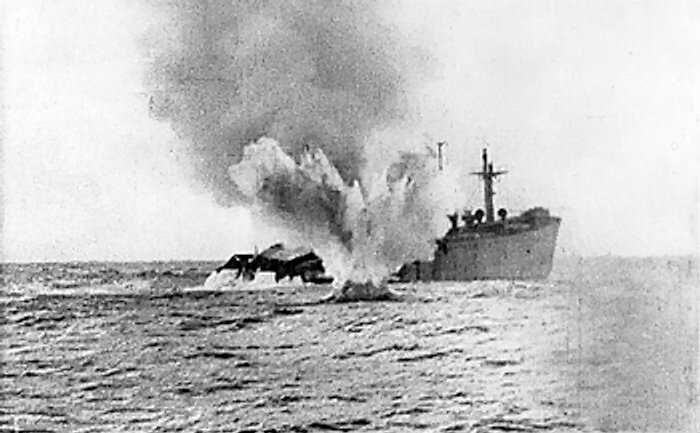 During 1941 alone, 3.6 million tons of Allied shipping were lost to German attacks. Though effective and dangerous, the German navy and U-boats were restricted by logistics and high command in their efforts; they actually backed off the attacks at a crucial point, giving the Allies a greater chance. Despite the German attacks and mines, 99% of all Allied shipping across the Atlantic arrived at its destination during the war. Approximately one convey per week crossed the Atlantic once the supplies were ready and transportation was regular. In addition to the Atlantic conveys (between U.S. and Britain), the Allies sent conveys through the Arctic Sea, transporting supplies to Russia; although this move wasn’t necessarily popular with enlisted and civilians, national leaders understood the importance of supplying Russia in the eastern front fight. Initially, Allied convoys reached Russia with relative easy – except for the weather; then the German navy and U-boats in Norway started hunting. Only a quarter of the supplies sent to Russia went through the Arctic Sea, though; routes overland through the Middle East and by sea in the north Pacific were also used. In the Mediterranean, the British convoy ships ferried vital supplies to the Allied stronghold on Malta, bringing thousands of tons of fuel, food, and weapons. The German U-boats raided and torpedoed in the Mediterranean, too, until the Allies established control later in the war; the Italian fleet lacked fuel and did not play any major role. The five Soviet armies who advanced in a New Year’s offensive were destroyed or halted by the Germans. On July 4, 1942 – after a 250 day siege – Sevastopol fell to the Germans, but cost them 25,000 dead and 50,000 tons of ammunition. 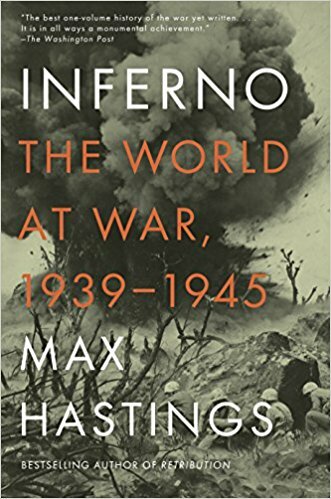 Hitler and his generals were still convinced victories would end the war and bring successful negotiations; Operation Blue was designed to seize Stalingrad, defeat the Soviet Army’s reserves, and capture the all-important oilfields. Moscow was not an objective. By early summer 1942, Russian had 5.5 million troops and their industrial output was producing 13.5 million tons of steel and huge numbers of planes, tanks, and other weapons. Operation Blue launched on June 28, 1942, with 3.5 million German troops, supported by an additional million Axis-friendly troops from other European countries. Toward the end of July, although over 700 miles from the oilfield objectives, Hitler declared Operation Blue complete and victorious. All the army had to do? Capture Stalingrad, a guarding Russian city on the Volga River. On September 12, 1942, the first German troops entered Stalingrad after a significant bombing and battle, following a delay from lack of fuel and shifting of troops to other fighting lines. Brutal street fighting ensued. 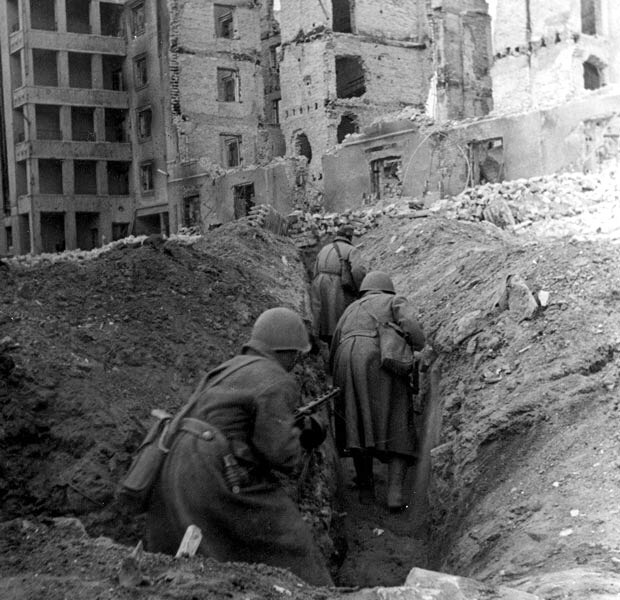 The siege of Leningrad also continued, and in August, the Germans launched another offensive rather than waiting in siege conditions; however, by January 1943, the Russians had broke the supply blockade around this city by taking a key location. Operation Mars – started on November 25, 1942 – when the Russians attempted to envelop the German Ninth Army; the attempted failed, costing 100,000 Soviet lives. German armies were encircled or forced to retreat, leaving Stalingrad to its embattled fate; they retreated under attack and not well supported by the Luftwaffe. By 1943, Soviet armies pushed forward, driving back German forces and recapturing significant amounts of territory; the Russians had outproduced and outenlisted their enemy, forcing the beginning of victory by sheer logistics. I was surprised to see the numbers and learn how much Allied shipping arrived at its intended destination, despite the U-boat attacks. For some reason, I’d had the impression that the losses were much higher. Always good to get the correct facts! In Chapter 12, it was interesting to see the comparison numbers of industrial output for Germany and Russian. By the end of 1942, the Russians were outproducing the Germans and turning out significantly better weapons technology; though the Germans continued to have better battlefield tactics, Russia owned the logistics. Also, the section about Russians’ renewed interest in religion and faith when Stalin eased the religious restrictions was insightful. Historically, people often turn to religion and faith in times of crisis. What historic facts or quotes really stood out to you? Share your thoughts and findings in a comment if you’d like. Reading madly to catch up! I had a bunch of responsibilities initially that had to be dealt with, so I got a late start. I am on Ch.8 and have saved the discussion posts. Good luck at the library! !